Objectives: Evidence suggests that oxidative stress (OS) plays a prominent role in the pathophysiology of pregnancy complications in women. The present study was conducted to determine the levels of OS markers in early pregnancy loss and to compare the results with those in healthy pregnant women. Materials and Methods: A total of 32 women with early pregnancy loss and 32 healthy women in the first trimester of pregnancy, with similar demographic characteristics entered this study as the cases and controls. Serum levels of malondialdehyde (MDA), total antioxidant capacity (TAC), uric acid, and bilirubin levels were determined in both groups. The data obtained were then analyzed and compared between the groups using the independent samples t test and Mann-Whitney U test. Results: The 2 groups matched in terms of personal-demographic characteristics including mother’s age, father’s age, gravidity, and body mass index (BMI). 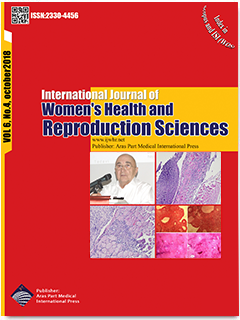 MDA levels increased significantly in the women with spontaneous abortion compared to the healthy pregnant women (4.35±1.47 vs. 3.42±1.68 µM/L; P = 0.026) and TAC decreased significantly in the cases compared to the healthy controls (552.34±212.79 vs. 1003.23±1168.68 U/mL; P = 0.040). Uric acid and bilirubin levels did not differ between the groups. Conclusions: The results of this study provides further evidence on the effect of increased OS on the incidence of early spontaneous abortion in the first trimester of pregnancy. High serum MDA levels and low TAC during pregnancy were 2 risk factors for spontaneous abortion. The present findings support the hypothesis that OS plays a key role in the etiopathogenesis of spontaneous abortion. Further studies are required for assessing the preventive role of antioxidant therapy in this complication.